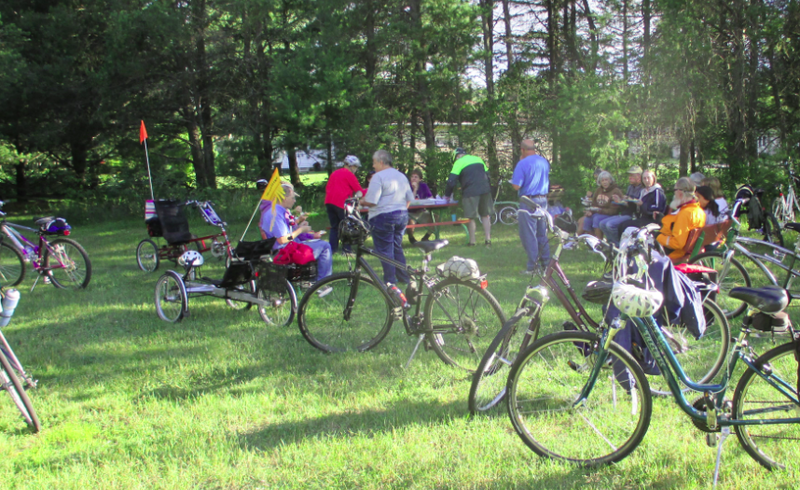 Remarkably pleasant weather arrived just in time for yesterday’s Poky Pedaling Potluck Picnic. Conditions all day had been cool and windy with ominously cloudy skies. But about an hour before our meeting time, the winds moderated and the clouds parted to reveal bright sunny warmth. Eighteen Poky Pedalers took advantage of our meteorological good fortune to enjoy a spectacular evening of Bike Fun. From Goerke Park, we set a course southeast on neighborhood streets towards Iverson Park, where we continued south on the Green Circle gravel trail that took us under the railroad tracks to Patch St. At the north end of the gravel trail, we paused to admire a brand-new Green Circle marker telling some of the history of Iverson Park. At Patch St, we headed east on a relaxing sidepath and then wound a route southward through the adjoining neighborhoods. Our ride of just under 4 miles ended at Parkwood Park on Feltz Ave, a block or two south of Heffron St. 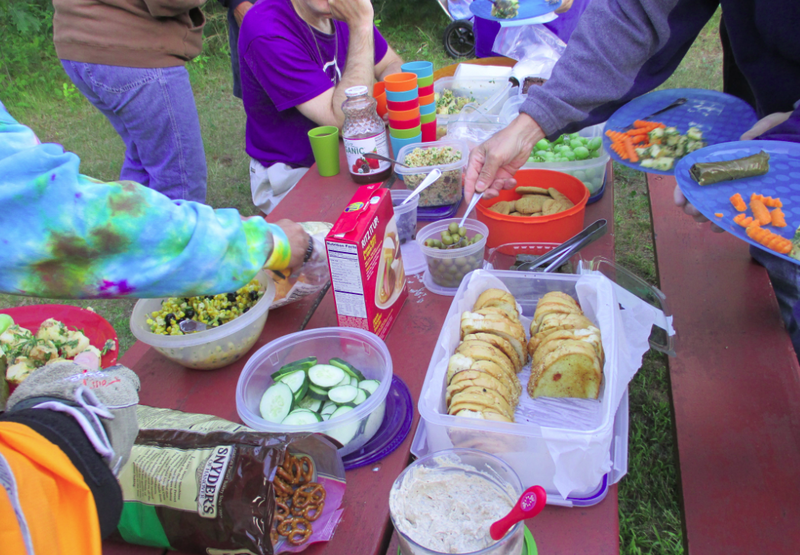 Upon arrival, we unpacked our picnic goodies and began filling our plates with a delicious array of food: salads, veggies, fruit, snacks, desserts, and more. We feasted while enjoying the company of Poky Pedalers in an attractive park setting under sunny skies. What a wonderful recipe for Bike Fun. Once we all had our fill, we packed everything up and made our way back to Goerke Park. Sunshine on our return ride lifted our spirits as another Poky Pedaling Potluck Picnic came to an end. Fortunately, it won’t be long until the next Poky Pedal. Make your Bike Fun plans for this weekend and beyond by checking out the Upcoming Poky Pedals page and the 2014 Bike Fun Calendar.